King John 'Hotrods' 1959/61. Left to right: David Miller, Adrian Chapman, Louis Phillips, Michael Dart and Andrew Gates. 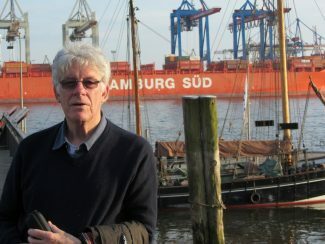 Adrian Chapman during a recent visit to Hamburg. I only recently discovered this web site and quickly found from reading through the pages that it brought back a flood of happy memories. 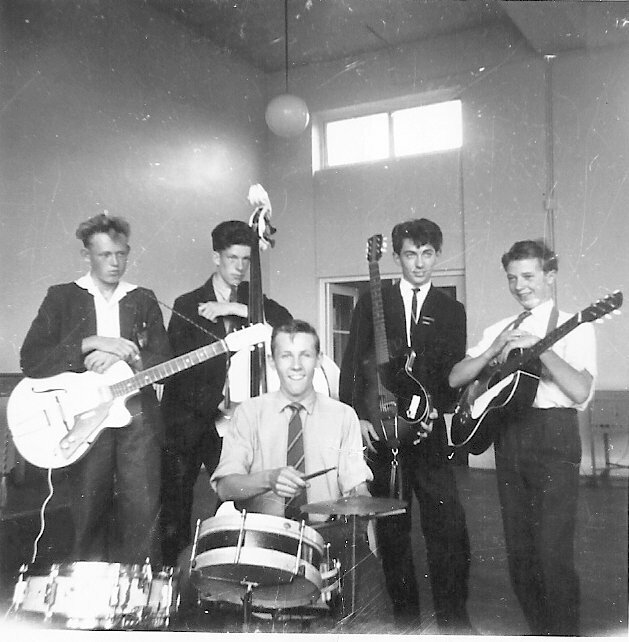 It was a great pleasure to read a comment on this site left by Doug Mansfield about the school band’s first double bass player. Doug handed me the white double bass when he went off to join the navy. I had little idea how to play the thing but Doug told me all he knew and that was a good start. With Mr Beddow running the show, you couldn’t help but improve with each session. I, like Doug, was very sad to hear of Melvin Beddow’s passing, not only was he a wonderful teacher but a good friend too. I don’t quite know how the five of us got together as a pop/rock group, but maybe the one common factor that we all shared, namely playing in Mr Beddow’s band, had something to do with it. He also greatly encouraged us from the word ‘go’. As I remember, the five of us, Louis Phillips (drums), Mick Dart (lead guitar), Dave Miller and Andy Gates (both back-up guitar) and myself (bass) all got on very well together. We were indeed influenced by the Shadows. The only enhancement we enjoyed was a single amplifier unit which was parked in the Assembly Hall above the girls’ gym. I think initially only Mick Dart could plug his guitar into the thing and …..yes… it did make us sound ‘a touch’ more professional. As far as I can remember, we didn’t try singing, which was perhaps a good thing. We performed at numerous school concerts – the girls loved Louis and Mick – the rest of us were left with their smiles – and some of the teachers began to lose their initial frown upon hearing pop music in a hallowed institute of learning. The name ‘Hotrods’ was my fault and I still feel a little guilty about it to this day. I was told to get a poster organised for a ‘Swimming Pool Fund’ concert which was to be held the next day. The responsible art teacher asked me at midday whether the poster was ready. I said ‘Yes Sir’ but that I still had to talk to the others about a name for the group. I was told that there was no time for discussions and that I should think of a name quickly. For reasons I can’t explain, the name Hotrods came up in my head a couple of times and that was it ….. just like that….. the group had a name. Two of the hits that we played we borrowed from (Sir) Cliff Richard’s Shadows, Travelling Light and Apache but there must have been more. We also played a number which we created ourselves and called Room 18 Blues as a sort of dedication to our other excellent music teacher, Ms McConnell, who taught in that room. At the time I recall that one or two of the teachers were somewhat worried about the amount of electricity that Mick Dart’s e-guitar consumed when we practiced….. after all, it was all the tax payers’ money. We normally politely referred them to Mr Beddow and heard no more. I’m not quite sure but I think that all five of us sang in the choir. For this we were awarded a small badge embossed with the word ‘choir’, I believe there was also a badge for those who were particularly good at ‘sport’. There may have been a couple more in addition to those of the school’s secret police: Sub-Prefect, Prefect and Deputy Head Boy/Girl and finally, Head Boy/Girl. I was happy with my ‘choir’ badge, it was only surpassed by the RAF who awarded a white lanyard to its singing trainees! The white double bass – also known as ‘Big Bessie’ – was carried home on several occasions so that I could touch up the white finish where the original had been chipped away. I never knew that a second double bass had been donated to the school. One small perk which musicians – school band, choir or Hotrods enjoyed was being given priority for any vacant seats available for the first school dinner shift. This system worked fairly well and ensured that Mr Beddow had most of his crew together for the mid-day band practice every Wednesday. He wasn’t too pleased if you wandered in just before the session ended. When I left school in 1961 to join the RAF, poor old Bessie was in a rather bad state. The bridge snapped twice and was temporarily put back together with the willing help of the woodwork teacher and his secret glue. Then the day before one of the big ‘Swimming Pool Fund’ concerts was about to begin, the front and the side casing parted company. The instrument vibrated terribly and had to be held together by the same glue and an enormous G-clamp! Surprisingly, the combination held until she was patched up again. Sometime before I left King John in the summer of ’61, it became obvious that an electric bass guitar was required and that dear old ‘Bessie’ just didn’t provide the sound required. So I left the group and I only wish I knew where they all landed up and also the ultimate fate of ‘Big Bessie’. I know the group continued to meet and practice for some time after we had all left King John and I also managed to keep in touch with Louis Phillips for a year or so. I paid him a chance visit once but he wasn’t there and I believe his mum said that he was working with an oil company somewhere, probably North Africa. Any news anyone might have on the whereabouts of the others would be most welcome. As for me, after twelve years with the RAF I took up teaching aviation English, retiring in 2007 at the age of 63. I am now living at the foot of the Alps, close to the Bavarian/Austrian border and enjoying retirement to the full. The three girls called themselves “The Three J’s”, and that’s because their names all began with a ‘J’. I think one was a Jennifer but that is all I can remember. I have good pictures of my car but am having trouble adding them to this page. I will have to wait till my 12 year old grandson comes for a visit. I remember your Mum quite well and my mind jumps back to an Easter service when I was very young. It was her way that people in the congregation would be picked to read the next verse about to be sung. The verse was about Jesus hanging on the cross dying. I read it as Jesus hanging on the cross drying. My sister and some of her cronies had hysterics and I was never asked to read again. My 5EX2 form teacher was Mr. Bailey, a very fine teacher and a favorite of mine with Mr. Lamborne. I have taught at two community colleges and can understand just how dedicated they must have been. My wife and I go to Cuba a few times every year and take bicycles as well as the maximum weight of clothes and footwear for the locals. It is a very poor country but the people are happy and are expecting great changes now that the US can visit. Our bikes are left there and shared around the local village. The only food shop is in the next village, 7km away and some days the bike does that trip four times ! I am going there again in January and will take new tyres and tubes. I always do a magic show at the resort and now the resort has been elevated to 2 1/2 stars up from 2, so Marilyn has great delight in telling people that I am only worth 1/2 star. I do shows at the local school which is great fun for everyone. I am known as Mahia Tony (Magic Tony) the kids never see magic so anything I do is well watched. My other pastime is radio controlled model gliding. My local club all fly 100″ span gliders and we have loads of fun at a sod farm where we can fly about all day. One of our members holds the Canadian record for duration flight at 8 hours and 7 minutes. I’m lucky to get a 1/2 hour flight. I tried to fly out of my farm but my biggest field is 4 acres and too short to land. There are trees at either end which means dropping fast and flaring hot, I have done it but is was not pretty. Well you’re a surprise for the books ! Your name rang the proverbial bell, but that was about it. I had to sit down and think a bit. In the end it was your mentioning the Salvation Army hall at Tarpots that began to bring back memories, even if a little vague. My parents were Salvationists at Hadleigh Temple and they fairly often lent a helping hand in getting the new little Tarpots Corps going. I’m pretty sure this must have had something to do with our getting to know each other. You also mentioned our first form (1EF) teacher Miss Fletcher. After 1EF, came 2EM with Miss Mason, a needle work teacher. But can you recall who our third form teacher was ? I have a total black out on this one. For the last two years at King Johns, 4EX(Tech) and 5EX(Tech), I was subject to the tender mercies of a Welsh form teacher by the name of Mr Jones. He wasn’t very humorous. Another question on the Hotrods. Tony, who were the Girls who sang with the Hotrods ? Could it be that they sang ‘Poetry in Motion’ ? It’s been a great pleasure hearing from far off Canada and to read that all is well. Look after yourself. PS – Love to see a photo of your Bugatti. Whoops – Sorry Tony, you wrote about three Girls singing with the ‘band’ and not with the Hotrods. Indeed, at one of the last concerts before I left school in summer 1961, we put a group together made up of Trevor Morgen (piano), Ken Ballard (cornet), Barry …. (saxophone), David Murray (clarinet ? ), myself (trombone). There might have been a couple more budding musicians whose names I’ve forgotten. I’m pretty sure that the three girls you mentioned were with this group and sang the hit ‘Poetry in Motion’. Who were the three beauties ? Anymore gen is more than welcome. By the way, a big thanks to Pete Robins for the tip on the Wanstall Family. A highly interesting read. Just scanning through the BCA for my Uncle Bert. 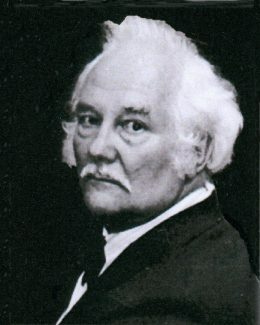 His family (Bardell) were well known around the Benfleet area. And I saw your page. How well you look and what a great story. 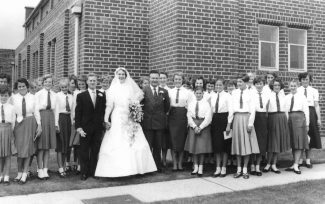 We met at the Salvation Army in Tarpots then in Miss Fletchers class at King John. I remember well the Hotrods and the boys. I also remember three girls that sang with the band, once, at a school concert. I moved to Canada in 1969 and now manufacture my own design of air quality equipment. I have four daughters and seven grandchildren, and yes they keep us busy. I always wanted an old style sports car, but they are too expensive, so I built my own, based upon a 1937 Bugatti but with lots of modifications. I live just outside of Paris Ontario about one hour west of Toronto on a 14 acre farm. We do not farm but have two horses and a donkey. I am semi-retired but my company is still active. On the side for fun I am a magician doing about 25 shows a year. Mr Wanstall was my form teacher (4EX2) and Mr Lamborne (5EX2) was my best maths teacher in the world. My mind still flashes back to his words when I get a numbers problem. I see Laura Green in the wedding photo of Mrs Richards. Laura and I worked together at MTE in Leigh, before I left for Canada and I was at her wedding to Chris Argent who was a Rover Scout with me. Memories are flooding back, thanks for that. Seems we might have a private thread going here Adrian, but I hope others will find it interesting as well. Re your comment on the Beverlys, the planes not the sisters, I’m so glad some-one else thinks highly of them. Indeed an unsung hero of the RAF. However, the Frighting Lightning was some thing to be in awe off. I remember one night, we had a full scale alert of a Russian invasion and sent off 16 fully armed planes, over the town of Beverley funny enough, in full reheat, at 2.30 am. You should have seen all the lights of town come on. The ground literally shook. Fabulous memories. Now-a-days, when I can afford it, I fly a 2 seat Jabiru LSA55 for pleasure. I didn’t know your maths teacher Sid, mine was My Lambourn and I was top of school in my final year, beating Keith Merrile by one mark. Gee it’s nice when my memory works. Hi Adrian, There is some more info on the late Mr Sid Wanstall and Family on the Hadleigh and Thundersley Community Archive, Title The last Shepard of Hadleigh Castle. P.S. I’m sure this site won’t mind you having a look. Good to hear from you again after so long. Even though our paths didn’t cross exactly, while you were tinkering with the glorious Beverly (that was an aircraft with character !) and the flying stove-pipe - I was enjoying life with 18 Squadron which was equipped with Wessex helicopters in Germany. When it got cold we still had our UN detachment in Cyprus where we could warm our feet. Unfortunately, with Mr Beddow now far away, I had no chance to get back to playing in a band anywhere. To compensate for this great loss, I got involved in broadcasting. As you will know nearly all big RAF stations had their own broadcasting Networks and I had a lot of fun as the young and upcoming DJ of the day !! Going on to another subject, a year or two ago a contributor wrote about how she remembered a teacher who could at times be distracted from his subject. She went on to relate the beautiful little story of the German submarine which turned out to be a whale. The teacher who told this story was without doubt my maths teacher Mr (Sid) Wanstall. He was an ex Fleet Air Arm Pilot and flew amongst other famous aircraft of the time, the venerable Fairey Swordfish. In closing, may I just back Doug up by encouraging all ex-King Johnites to keep the memories coming in. It’s simply fun and helps to keep the grey matter active. Hi Adrian, time to catch up. Thanks for your comments in your write up, and it’s nice to see Big Bessie again, you must have coined that name, not I. I never made it into the Merchant Marine(not R.N.) but went into the RAF like you. Did 15 years working on 47 Sqdn Blackburn Beverleys and E.E. Lightnings of 19, 23 and 74 Sqdns. Whilst on a posting to Singapore, I played bass in a trad jazz group in the very famous Raffles Hotel and also up country in Malaya on a plantation owners club night. That paid really, really well as they were the biggest load of drunkards you’d ever meet. Don’t play any more though. Now retired just outside of Adelaide, South Australia, I spend my time designing recreational aircraft and will, one day, build one. I now hold a lapsed flying certificate but the can soon be renewed. A note to all readers, please keep posts coming in, I’ve just spent a few wonderful hours reliving my youth through your messages. Thank you all.